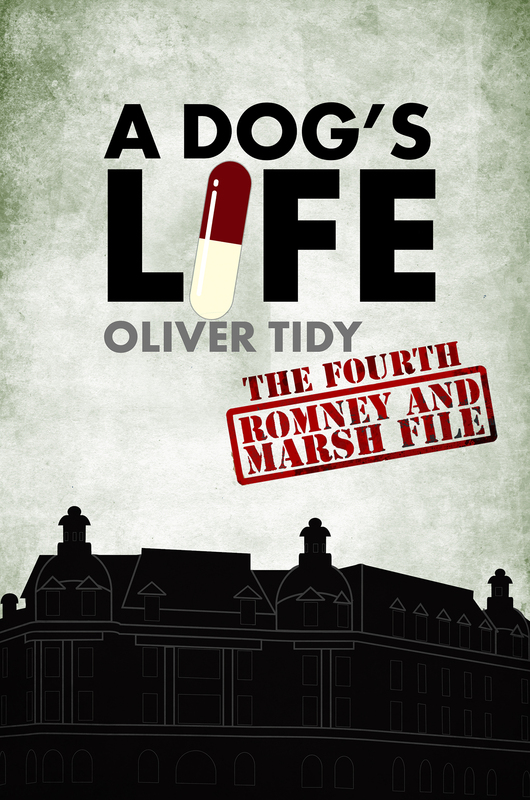 There’s only one thing on my mind this week: A Dog’s Life – The Fourth Romney and Marsh File. As you can see, I have the cover – I like it a lot. Slots right in with the rest of the series – and the emanuscript is with the gentleman who does my proofreading these days. I am terrifically excited and excitedly terrified in equal and opposite measure. I feel a weight of expectation for this title unlike anything I felt for my two Acer Sansom books and the Booker and Cash title. They were new directions – virgin territory for me as a writer. Romney and Marsh are semi-established, like a Russian military presence in Ukraine without the laughs. I understand that the R&M Files have a small fan base (this knowledge makes me so proud). There are readers who are looking forward to the next in the series – they’ve told me so. It is inevitable that readers of the series are going to judge it against the others. It’s what we do when we’re into characters and a series of books. Nothing wrong with that. It’s natural. It’s the way of things. I’m a student of Amazon charts, readers’ comments, other crime writers’ feedback. All the big guns who have a decent crime series going attract a large number of comments that often have something to say on a particular title’s merits when compared to what’s gone before. But now I’m the other side of the inkwell, I can tell you, it makes me nervous. Even with only the three R&M Files that are out, I’ve had a fair few comments comparing them. Readers have their favourites. A few readers have voiced disappointment when comparing one title (usually the third) to others. I didn’t have a problem with those comments because I took the series in a direction that was not planned from the start and if one was reading the books in order, I can accept that one might feel the difference and not warm to it. Let me explain. I never set out to write a series of crime books. It just happened. I wrote Rope Enough and when I finished I thought that there might be another book in those characters. I enjoyed the writing experience. It was about halfway through writing Making A Killing that I realised the direction I wanted to take the characters in. Followers of this blog will know that I think I’m funny sometimes. Halfway through Making A Killing I serendipitously arrived at an opportunity to try a bit of humour. I liked it. I enjoyed it. I tried a bit more and then I went back and looked for anywhere I could fish for a smirk from my reader. In Joint Enterprise I went looking for funny with a net. It was a large part of my thinking whenever I sat down to write. That first one, Rope Enough, was altogether more serious, although I do remember just one or two very small occurrences that cropped up and made me smile. But I kept a lid on it. It was a crime novel after all, a police procedural. They’re not supposed to be humorous. Humour is such a personal thing. It’s dangerous to try in a crime book. Risky. But for me it’s utterly worth it if it can be pulled off. However, as a series goes on it must become more and more difficult to be originally funny with the same characters and the same locations. And then there’s the crime and it’s solving. Crime writing has a rich and illustrious history. It must be one of the most popular reading and writing genres. There are so many great classic crime novels and contemporary ones and then there are thousands that are still very good. And what they must all have is a good crime that is well solved. If that criterion isn’t fulfilled readers are going to get tetchy. When readers of crime pick up a crime book it’s like a contract has been entered into. They have a right to their expectations regarding the writer’s ability to craft a believable criminal yarn. Everything else is secondary. I’m hoping A Dog’s Life can be out in a month or so. But don’t hold me to it. Things happen. Price – £1.99, just like #2 & #3 after my try before you buy offer of £0.00 for Rope Enough. This entry was posted in Self-publishing and tagged A Dog's Life, Romney and Marsh, Romney and Marsh Files, self-publishing writing, writing by olivertidy. Bookmark the permalink. I for one will definitely be buying this book, if it’s only half as good as the others in the series, it’ll still be a good read. That’s very kind of you, Russell. Thanks for your support. I also will be buying the book. It’s been too long. I’m looking forward to reading R&M and get emerged in Dover CID! I’m sure it will be a good read. Thanks for your continued support. I hope the wait will prove to be worth it. Great news I can’t wait!!! Introduced others to these too, especially as I live and work close to where the books are set. Now where are the TV companies when you need them? Two great characters in a fantastic setting by the sea, why haven’t they picked this up??? Yes know have said before but just keep hoping that eventually someone who can do this will see my comments and run with it! Thank you for another warming and encouraging message, and your very kind words. I’m glad you’re looking forward to this one. I hope it doesn’t disappoint. Every time I write about R&M I can see them on the TV. I’m sure all writers feel the same about their characters, but I doesn’t hurt to dream a bit. I honestly think that Dover would make a terrific location. Cheers, Mike. Appreciate you saying so. Thanks for your continued support and your comment. Much appreciated. I too will buy your next R&M book, A Dog’s Life. Even though you said you didn’t set out to write crime fiction, you do it rather well. You have a terrific sense of humour and it’s good you inject some of it into your work. I like the fact you write about people who come off the page as real. Nothing bores me more rigid than having to trudge through paragraphs on police procedural matters: especially in bed late at night: there’s a time and place for everything. My normal reading habits are crime fiction, action adventure novels or the classics; not had the desire to read JKR. Gave Andy McNab a try once, but got bogged down with his weapons: also needed an interpreter. I digress a little here, but a not so well-known fact about these SAS guys is, their partners say it’s true they can get in and out without them ever noticing. Now, on to the topic of planning. Writing crime fiction, I would assume, has to be planned to a certain degree, but I believe stories can evolve organically: not to be forced. A book is like a bird (of the feathered variety) it cooks better without all that stuffing inside. The ability to write a believable story that is fulfilling to the reader is paramount, and it’s what most authors aim for, no matter what genre they write. So, I am now looking forward to another damned good read, A Dog’s Life. Can’t wait as I’ve just finished a detective story that sounded and started very promising, then went down like a fart in a lift. Many thanks for your very kind words on the R&M Files. Much appreciated. I hope that the next doesn’t disappoint. I’m with you on wading through the treacle of procedurals and armaments. I can enjoy a book without it all. Hand on heart, I really don’t plan. Most of the time I start a book not having the faintest idea how it’s going to end or who the bad guy is. Ray Bradbury, apparently, liked his books to write themselves, if you know what I mean, and so do I. It’s far more fun and exiting in my opinion. And I don’t like planning much for anything in life. (Maybe that’s why my life is such a train wreck!) I am firmly in the school of make it up as I go along. Works for me. That said, I know exactly how Acer #3 is going to end and what the twisty bit will be but only because it just hit me as I was walking somewhere. I’m still not planning on paper for it though. The following may sound corny but I’m so glad you let things develop organically. When a writer does this you know it’s from the heart. Just go with the flow and that little seed in your head will blossom like it always does. Told you it was corny, but it’s true. Many thanks for taking the time and trouble to get in touch, and with such a great and encouraging comment. Messages such as yours really are a boost. Thank you. Not everyone likes Romney, so it’s good to know he has some admirers.